It seems almost quaint today to think of the stir that was caused in 1973 when the CIA helped overthrow the democratically elected government of Chile. It’s not like the CIA hadn’t run a coup or two before that, but this time it was a democracy they were toppling. The problem was that president Salvador Allende’s government wasn’t the democracy Nixon and Kissinger wanted in power. 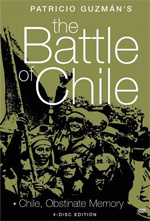 The CIA’s mischief in Chile is really a postscript to the story of The Battle of Chile. What director Patricio Guzman set out to film was the peaceful transition of the Chilean society to Socialism but he ended up recording the counterrevolution of the middle class against that change. He and his crew were in the streets and factories filming the events that led to a military coup that ended the elected Chilean government and Allende’s life. In a bit of historic irony, the day of the coup was September 11,1973. In tone, the closest thing to Battle I can think of is To Die In Madrid, Frédéric Rossif’s 1963 documentary of the Spanish Civil War. But unlike other documentaries, Battle is not a compilation of film clips and interviews made after the fact but was filmed while the history was being made. I think we need a different name for this kind of film. It’s more than just a documentary, it’s a part of the history itself. In an included modern interview, Guzman explains that he felt all of the footage needed to be shown. So in the course of editing it, Battle then became three films: The Insurrection of the Bourgeoisie, The Coup D’Etat, and The Power of the People. This makes Battle an epic film to watch and there’s lots of talk in between the marches and political “actions.” On the other hand, it seems unfair to cut out the many Chileans who had their town hall moment recorded, and besides, it documents how politically articulate the average worker was. Guzman is unambiguous in his politics and is not a neutral bystander. Yes, Battle is propaganda. But unlike a Riefenstahl film, Guzman lets the camera roll while very ordinary Chileans do the propagandizing. And at the beginning of the film he also shows Allende’s opponents expressing their views. What might be lost today is the feeling by the filmmakers that it was unbelievable there were Chileans who did oppose Allende. And it may surprise some that Allende’s opponents were unabashedly fascists. One scene shows a counterrevolutionary protest march of middle class young adults wearing armbands with crypto-swastikas. Presumably the real one was still too edgy for 1973. But the afro’s, short jackets and flared pants are cute... disco fascists! The point is made that had it not been for the interference of the Americans, the move to socialize Chile would not have been thwarted and Allende would not have been killed. However, while the film was being shot, the CIA’s involvement was only assumed; it wasn’t until later that it was confirmed. There is no doubt that the CIA encouraged counterrevolutionary terrorism and the US embargo of raw materials to the Chilean industries did hurt the country. But to me it seems that Battle unintentionally also documents the determination of the opposition. The Bourgeoisie and the Army were opposed to Socializing Chile and were ready to, as they used to say in Viet Nam, burn the village down to save it. Battle is thoroughly a 1960’s-style documentary film. The idea of an impromptu and independent young leftist film crew turned loose with a couple 16mm cameras and stack of black and white film stock (sent to them by French filmmaker Chris Marker) is from another time all together. When Battle was originally shown in theaters, it was seen as a unique and heartbreaking document, a victory of the bad guys over the people. And it is still a unique and sad film today, but perhaps not for the same reasons. To me Battle has a strange quality of having transcended its subject matter and become part of its subject. It is itself a historical artifact and is, for that reason, unlike any other film I’ve seen. Chile, Obstinate Memory (1997) is a fourth film that has been included as an extra feature in this set. It is a documentary Guzman made on a return trip to Chile in 1997 (Guzman now lives in France). Including Chile, The Obstinate Memory is more than an just an “added feature” to this DVD set, it acts as a bridge from the present to the past and is correctly a fourth film in the set. There is also an interview with director Guzman that covers (in part) the fate of Battle cameraman Jorge Müller who was one of the “disappeared” after Gen, Pinochet came to power. Considering the 16mm film stock and the in-field recording of audio, picture and sound are surprisingly good. Brushing up on your 1970s history will help, but is not critical; Guzman and the Chilean people do a good job explaining what is going on.